"Terror is when someone other than God decides when you are going to die"
When the attacks in Mumbai happened, the incident was what we were glued to on the television, read in the newspaper, discussed it everywhere possible and then forgot. But for the ones who had to face it one on one, I thought about it back then and read one such today. Thanks to Blogadda's Book Review. The book was a quick read, but I only wished with every line that this never happened. Writing fiction is like giving wings to your imagination, but writing reality is like tying it all down. The latter is more tough especially with issues such as these. 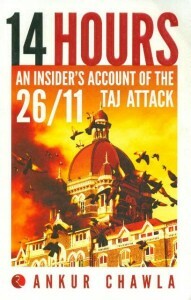 The details of the fateful day from an another perspective, a closer one in fact are portrayed in every page. What was for us people to see when it happened was just made more safe. To put it onto paper, such experience firstly commendable. The flow and choice of words, the descriptions and comparisons, the conceptions especially the ' No shift down South because I do not like South Indian food' well those are some flip flops you cannot ignore if you are the kinds who thinks there is more to India than north, south, east and west. You know what makes us easy targets? Our weak ideologies at all levels, from governance to law to daily living, not the lack of safety or strength. "It is not about smile. It is about heartbeats" this was told to the author and his team when they were planning the strategy for evacuation. How much more right they could get, if every person has this thing in mind none of us will have to fear a stranger with a gun on our chest every time we walk on the road. It is one thing to have a bullet brush through your pant and have a big hole as one of the author's colleague says in the book, the other thing is to have a bullet hit straight on your forehead and have a big hole there. The hole is what matters, the bullet is just the same. Unfortunately some who know this use it for all their sins. Usually when a book is readable, I wish the author comes up with something more. I seriously wish the contrary for this one for reasons we all know. Who would want to write about it in the first place, and who would want to read about it if not for the curiosity which gets more than concern? Before all that, who would want to face terror. Would you? P.S : This review is a part of the Book Review Programme at www.blogadda.com Participate now to get free books.